1. Preheat the oven to 150ºC/gas mark 2. Place the sugar, orange zest, lemon zest, tea bag and vanilla pod into a small saucepan with 100ml cold water and bring to the boil. 2. Put the dates into an ovenproof dish and strain the just-boiled liquid over. Add the lemon juice, orange juice and dark rum and stir. 3. Tightly cover the dish with foil and cook in the oven for about 30 minutes or until the dates are tender. Remove, allow to cool a little then purée in a blender. The mixture will keep for 4 weeks in an airtight container in the fridge. 1. Increase the temperature oven to 180ºC, gas mark 4. Cream the butter and sugar together until fluffy, then gradually add the eggs. Once incorporated, add the sieved flour and a pinch of salt and stir until combined. Place in the fridge for at least 30 minutes. 2. Remove the pastry from the fridge, place on a floured surface and roll out to 1.5mm thick. 3. Line a 10 inch cake ring and allow to rest for 10 minutes, then bake blind using parchment paper and baking beans, rice or flour for 8-10 minutes until the pastry is golden brown. 4. Remove the baking beans and paper, brush with the egg yolks and return to the oven for 1 more minute. This will repair any cracks. 1. Reduce the oven temperature to 110ºC, gas mark ¼. Split the vanilla pod in half lengthwise, scrape out the seeds and place both seeds and pod in a pan with the cream and half the sugar. Bring to the boil, remove from the heat and leave to infuse for 5 minutes. 2. Take out and discard the vanilla pod. In a bowl, mix the rest of the sugar and the egg yolks together until well combined, then pour in some of the infused cream mixture and stir gently with a spatula. 3. Add all the egg mixture to the cream, stir gently, then pass through a sieve. Spread a thin, even layer of the date purée over the bottom the cooked pastry case, then add the custard and bake for 1 hour 15 - 1 hour 30 minutes. 1. Place the cream, milk, 40g of the sugar and vanilla seeds in a large saucepan and bring to the boil. 2. In a bowl, whisk together the egg yolks and remaining sugar. Once the cream and milk mixture has come to the boil, pour half onto the egg mixture and whisk. 3. Add this back into the saucepan and continue to whisk over a medium heat until the mixture reaches 80ºC. 4. Pass through a fine sieve into a bowl, cover with cling film and allow to cool slightly, then place in the fridge. 5. Once the mixture has cooled, whisk in the Armagnac and churn in an ice cream machine. Store in an airtight container in the freezer until required. 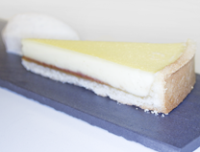 Serve a slice of the tart with a quenelle of the ice cream.